Planning up a regional flight? 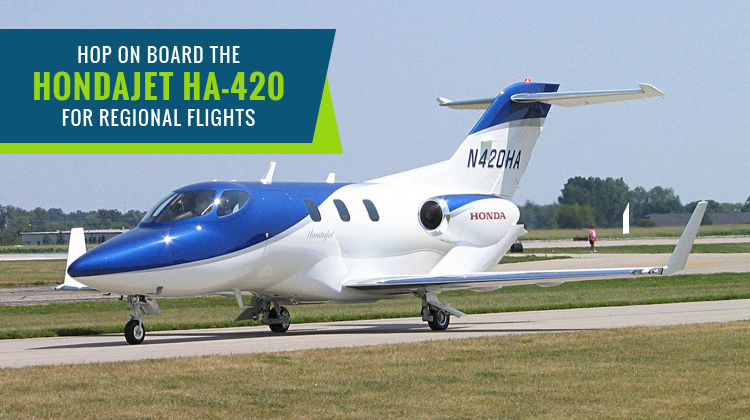 Then it sure would be a great idea to charter for a HondaJet HA-420. With its well-made, high quality interiors you can sit back and relax for a few hours to prepare for upcoming meetings at your intended destination. This 4-seater, business jet has a quiet cabin since its engines are mounted over its wings. Each seat can be pivoted. It also has a tray which can be pulled out for refreshments, or if you’ll need to work on your laptop throughout the flight. The small jet has a powerful set of flying mechanisms with 2 GE Honda HF120 engines. Additionally, pilots are always happy to fly its Garmin G3000 avionics system. You can fly thousands of miles with this jet, and it’s quite useful especially if you will need to reach other nearby countries. Charter for this jet if you’re in Ontario and you’d like to have a vacation to the Bahamas. It’s also the ideal ride if you’re about to meet an associate at Quebec. As you hop aboard the HondaJet HA-420, you’ll get to see how every detail of its interiors have been excellently made. Each seat’s leg room is spacious enough for your feet to stretch out. Plus, the cabin’s walk way has sufficient space for passengers to reach the lavatory or find each of their seats. Each seat’s foldable table also has two cup holders and generously installed lighting. The other standard feature which the HondaJet HA-420 has is its control panel provision for each seat. Simply lift the rectangular lid on top of each window-side armrest, and you’ll see your options on Audio, Lights, Window Shades and more. You may even check on your flight information on the very same panel. 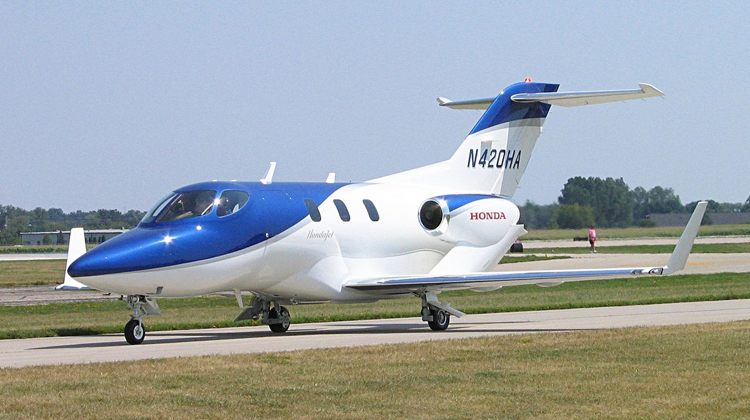 Most critics see the HondaJet HA-420 as the sports car version of planes. This jet is lauded for having a higher operating altitude compared to its counterparts. Its wing-mounted engines not only provide quiet cabins, they also aid in the aerodynamic efficiency of the aircraft. The HondaJet HA-420’s latest certification was granted by the Federal Aviation Administration (FAA) just last year. Since its newest version has been introduced in 2016, Honda Aircraft Company produced over a dozen units of the HondaJet HA-420 so far. The interiors and even the plane’s exterior design may look simple and sleek, but its performance has been highly regarded especially among avionics experts. The HondaJet HA-420 is a product of a Japanese manufacturing company’s three-decade long studies on small sized business jets. The earlier components of Honda’s prototype jets were further assembled in a Mississippi flight research laboratory until the 90s. With numerous tests and development stages, the HondaJet HA-420 was finally awarded with a certification in 2015, enabling its production among businesses and relevant organizations.